Our line-haul fleet comprises of 350 vehicles with a further 250 rigid secondary distribution vehicles. We have an impeccable service record spanning 40 years of success in the areas of primary transport and secondary distribution, including despatch bank and cross dock management. We are one of only a few independent logistics providers that has a fleet that can readily switch to high volume or contract projects. We have a mature, but adaptable logistics network that allows for variations in demand due to seasonal peaks, without putting a strain on resources. At Bakers, we ensure that our sales and administrative support services are staffed by people who are passionate about delivering exceptional service. To further cement our dedication to our clients, our staff have access to both training and business infrastructure in order to meet client’s expectations. We understand the needs and industry of our clients and are able to provide a competitive solution for their logistics needs. We pride ourselves on servicing clients in a world-class manner by providing them with the most cost-effective logistics solutions available. Bakers have invested in integrated software platforms in order to provide customer-specific solutions. Our fleet is managed and monitored by enhanced telematics solutions. This enables us to provide clients with real-time tracking and 24-hour monitoring. By analysing the telematics reports we are in the position to optimise operational performance and asset utilisation. Live data links enable us to track locations whilst passive information is assessed to guide the implementation of operational improvements. Our internal administrative computer network, procedures and policies provide an integrated solution for our focus on efficient, accurate and effective service delivery. We provide real-time load tracking facilities to customers and are accessible over a web portal. Some vehicles have been fitted with onboard cameras with live streaming to a closely monitored media centre, ensuring the safety of our staff and customer consignments while on route. 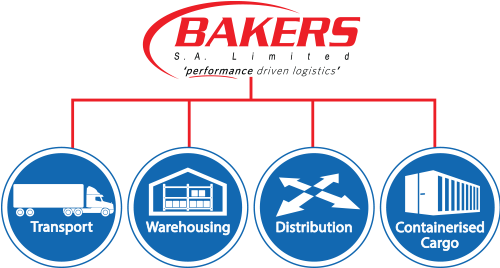 Bakers have also implemented planning and operational software, which automatically routes deliveries on reduced kilometres and most fuel-efficient journeys’, saving time. Other software implementation includes a warehouse management system, which operates by scanning manufacturer barcodes of the product on to the system, creating a serialised inventory management system, providing bulk order status updates by load. Clients receive a complete and focused service. Our value added services lie in a combination of unparalleled supply chain management skills and an extensive resource base of primary transportation, warehousing, cross-docking, despatch bank management and secondary distribution – all supported by cutting-edge technology systems. A group strategy that incorporates various compliance and good governance policies which include quality, road and fleet management as well as ethics compliances. Certifications received include ISO 9001:2015, RTMS and SMETA. Integrated software platforms that enable online visibility throughout our logistics network which creates complete transparency. A personal touch when it comes to customer service that features a dedicated department, direct involvement of executives and senior management to ensure the implementation of fast and effective corrective action. Customised solutions that are driven by innovation, adaptability, agility and client input. With a focus on flexibility within the contract term, we constantly review and improve solutions to ensure a mutually inclusive and beneficial partnership. Bakers S.A. Limited is the largest logistics organisation that has been awarded a multisite ISO 9001:2015 certification by TUV Rheinland. Our business quality management system empowers our employees to work smarter, as well as being of lasting benefit to all our customers. SANS 1395-1-2014 RTMS Standard is now associated with SANS to provide you with assurance of high standard of compliance against the national standard. This encompasses the safety of road infrastructure, customer consignments, vehicles, drivers and the public.